Popular apps for the iPhone and iPad, some of which usually go for up to $20, were being offered for free in Apple’s online App Store on Monday, possibly in conjunction with the store’s fifth anniversary. Popular games were in abundance on the list, with “Infinity Blade II,” “Where’s My Water?” and “Tiny Wings” among them. The steepest discount appeared to be Traktor DJ, a suite of tools for mixing and recording music that usually goes for $19.99. MapMyRide+, photo-text app Over and recipe app How to Cook Everything also were among the apps being offered for free Monday. Apple did not immediately respond to a request for more information about the free apps. In May, the App Store passed a staggering 50 billion downloads, according to Apple. It seems likely that the apparent promotion will be part of an effort to commemorate July 10, 2008, the day the App Store went live as an update to iTunes. It increased the appeal of the iPhone, and later the iPad, and created a sales model that has been adopted by rivals like Google, Microsoft and BlackBerry in the years since. That’s led to Apple to trademark the term “app store” in an ongoing effort to protect the term. 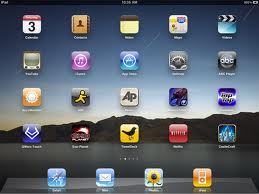 In 2011, Apple filed a lawsuit against Amazon, which rolled out the Amazon App Store along with its entry into the tablet market with the Kindle Fire. Last month, the two companies failed to come to an agreement after new rounds of negotiations. Apple argues that Amazon infringes on its trademark by calling its store that sells apps an “app store.” Amazon argues that the words constitute a generic description. The term “app,” as applied to computers, dates at least to the 1980s. Google’s app store, for users of its mobile Android operating system, is called Google Play. BlackBerry has BlackBerry World, and Microsoft’s merely says “Windows Phone” at the top of its mobile store’s homepage.